We are now a card carrying member of the sunburst mirror club. This was such fun to make and came together really easily considering all the moving parts! 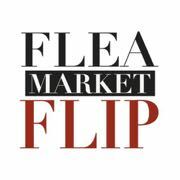 I have a full material list for you at the end of the post so read on for the step by step! I need to interrupt though, because if you’re anything like me, having read the title of this post, you now have the first chords of Rob Base and DJ E-Z Rock banging around your groggy head. You’re welcome. Sorry, I’m back. 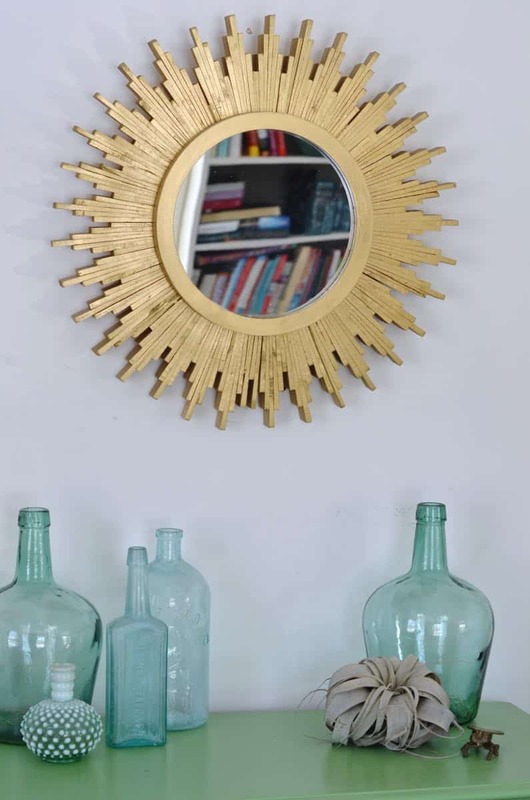 Google “sunburst mirror” and you’ll see them everywhere… they’re amazing. 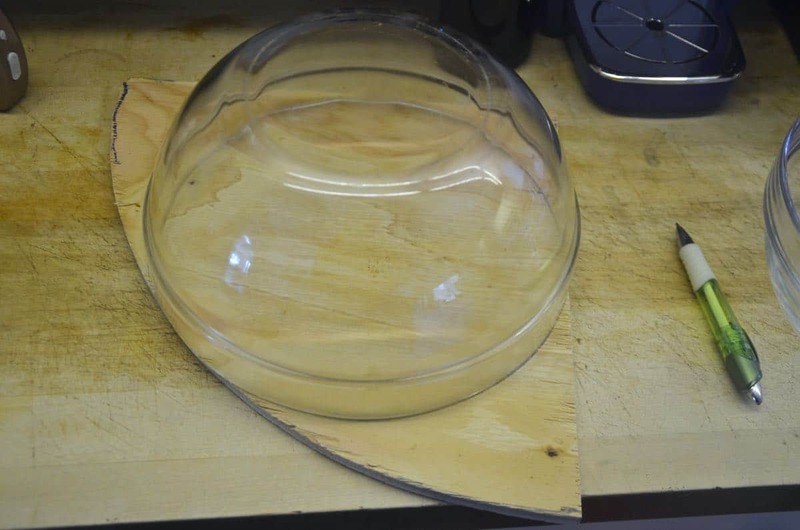 Of course when I saw a string of these I could DIY on the cheap, I added it to my project list. There were lots of varieties. 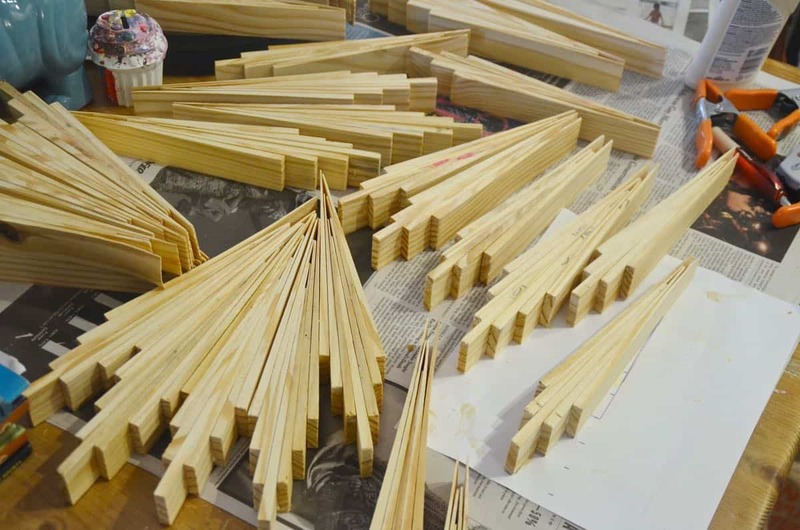 Some with paint stirrers, some with dowel rods, some with cardboard… all lovely. BUT… the ones I liked the most used shims. They felt a little more consistent with the real deal, I liked the scale, and… still simple to construct. I checked out this and this post to make sure I was on the right track. 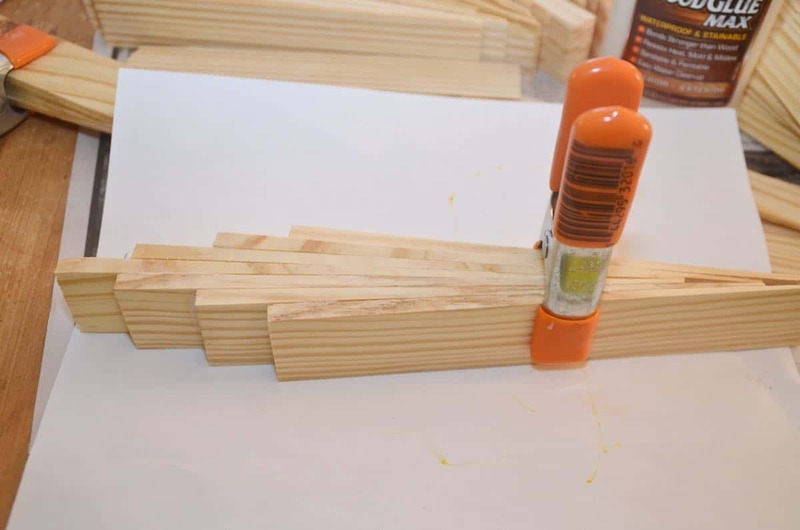 The first thing I did was lay out my shims to see if they came together as easily as these blogs made it sound. They do, they really really do. I played around with ‘ray’ patterns: more uniform vs. more varied… I liked the varied. 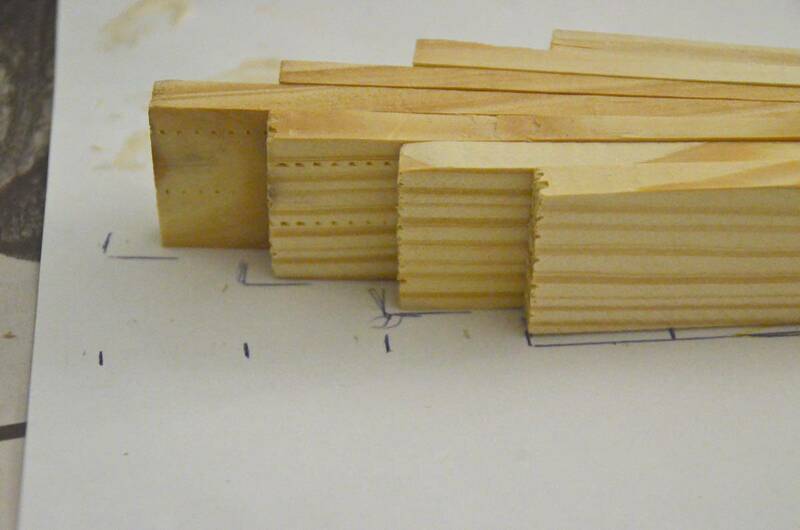 For assembly, I followed the lead of these other bloggers, and made each ‘ray’ individually first. 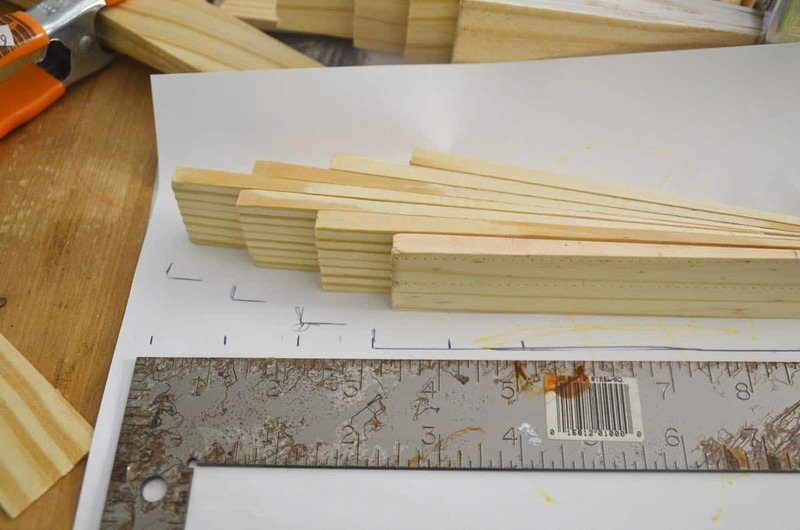 My system was very detailed and sophisticated (not)… I wanted each shim to be about an inch below the next so I figured out one, traced it, and then used this outline as my guide for all the others. 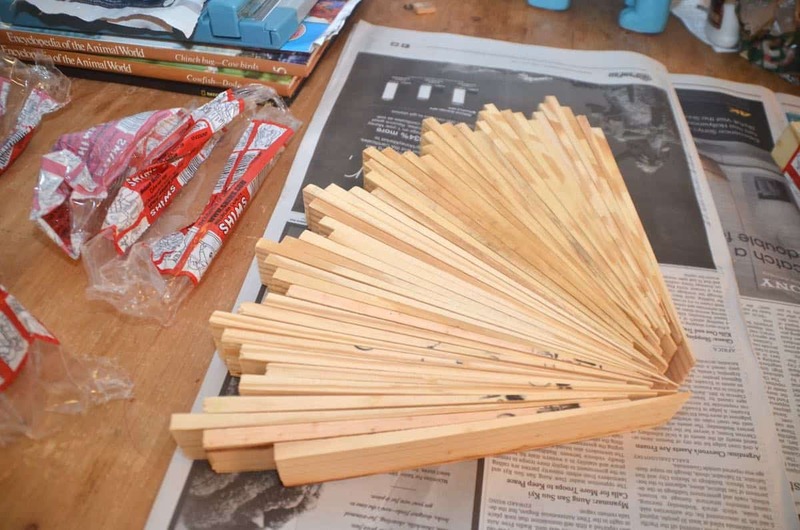 At first, I made my rays and used clamps to hold them together; but my wood glue was pretty tacky so by the end I just glued and waited for them to dry. 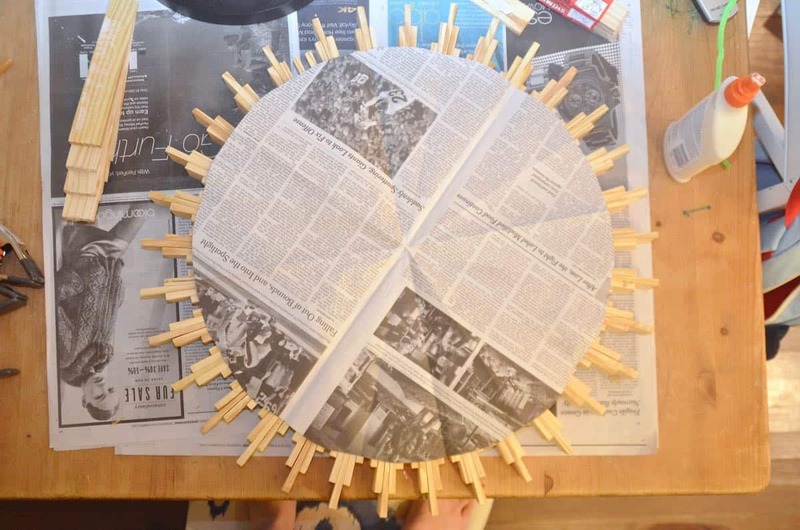 Piecing them together was simple, but getting the ‘perfect’ circle was trickier. I used a piece of newspaper to help guide my rays and tried to manipulate them all as best I could before the glue dried. 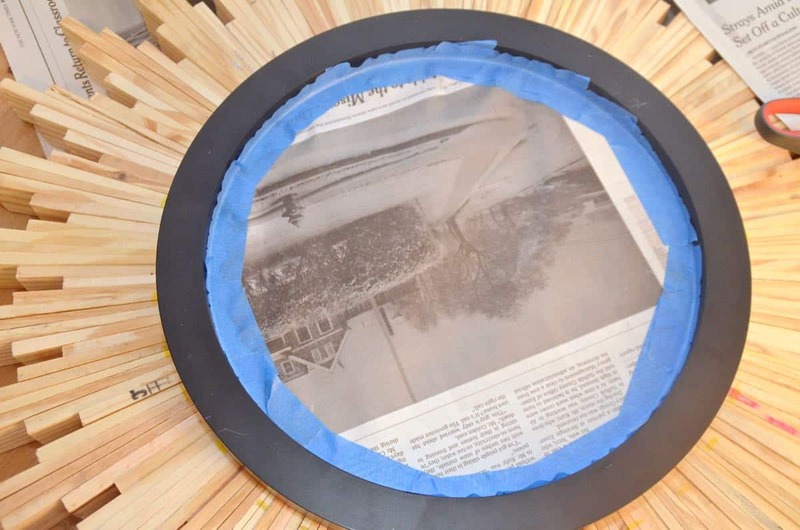 I had to get creative where the circle came together and ended up inverting a couple of shims so the wider side was actually towards the middle of the circle. 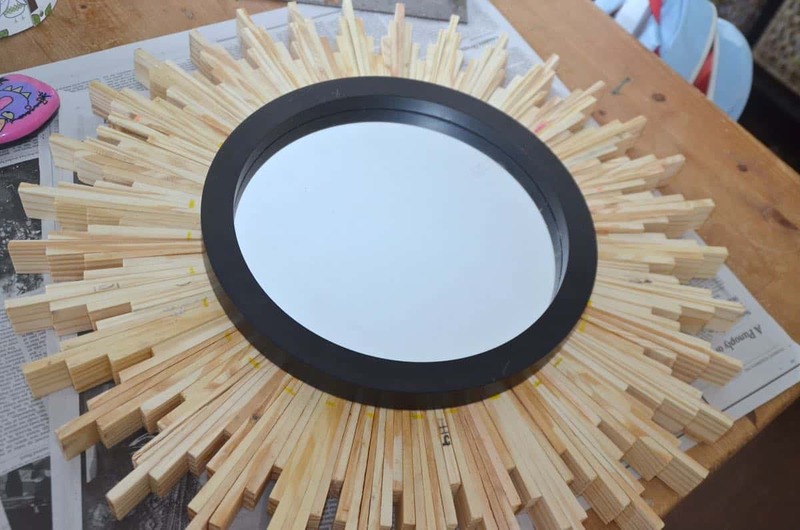 I let the shims dry for a day, then glued my round mirror right on top being careful to measure that it was centered (that’s what those yellow hash marks are for…). After a day for the glue to dry, I spray painted it metallic gold. 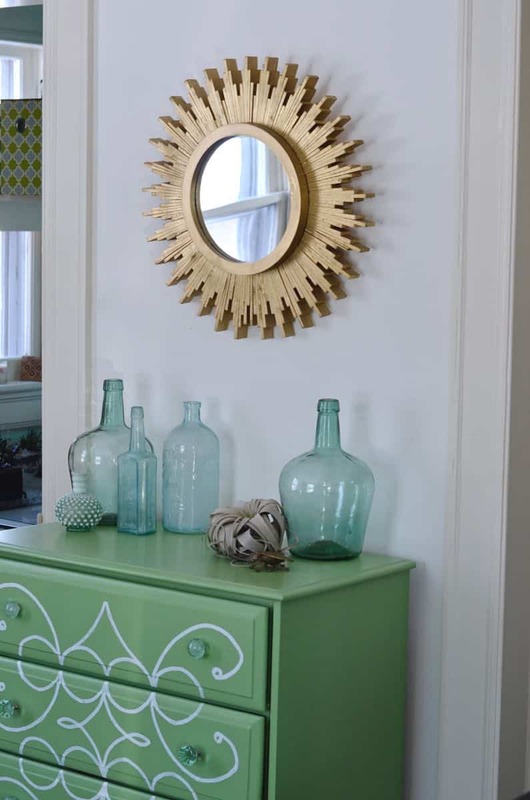 (Any color would have looked fine, in my opinion, but many of these sunburst mirrors are a metallic of sorts.) I simply taped some newspaper over the mirror (trimming the rough edge with an exacto knife) and sprayed the whole thing. 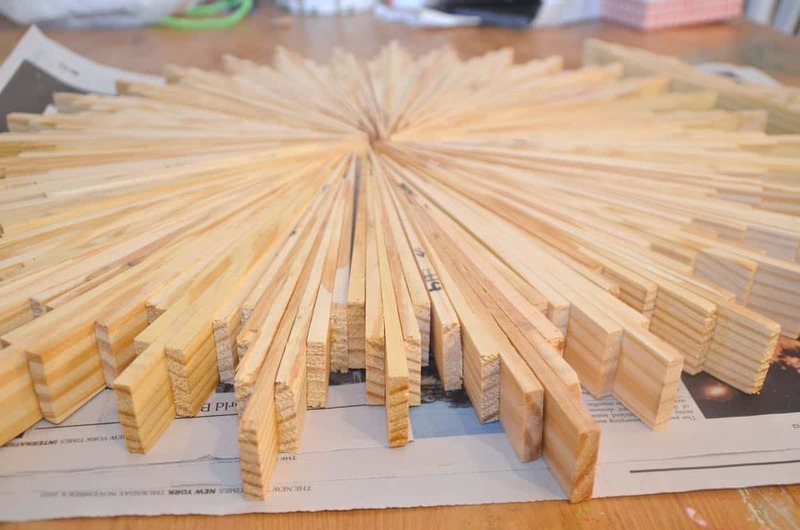 For hanging, I used my jigsaw (Mark has since deemed it the best tool in our tool collection) to cut a circle out of some scrap plywood. With super strong industrial gorilla glue, I stuck this on the back of the mirror. I like the mirror, like a sun in home. The mirror looks great. This is so incredibly super, terrific fabulous. Mouth wide open…..Wow is all I can say! 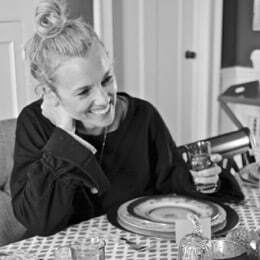 ok, so I’m searching on Pinterest for a sunburst mirror inspiration and I stumble on your blog. Now I am doing my 10th grade cheerleading dance to “Joy and Pain”. Now I feel like going to bathroom and teasing my bangs. Thanks for the trip down memory lane and the nice mirror inspiration. I LOVE this! 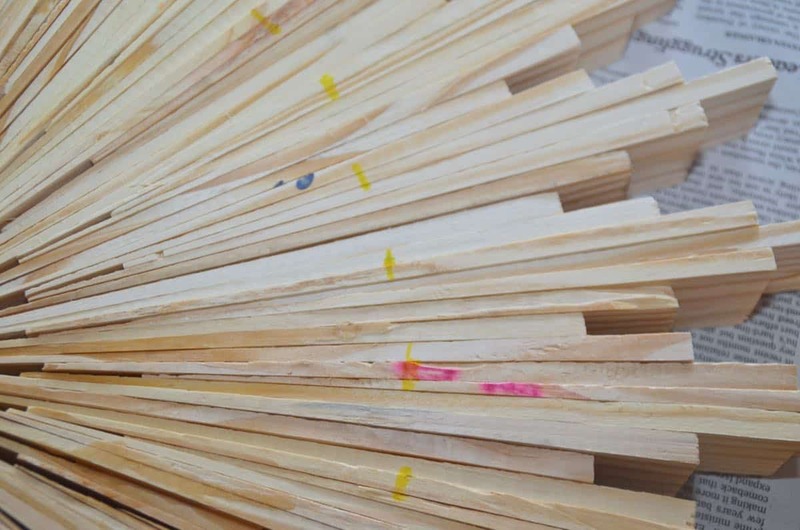 What length were the shims you used? The second I read the title that song came in my head!! I love it! This is exactly what I want to make! So I have some questions 🙂 How big is your mirror (inches) and what brand of spray paint did you use? That is AWESOME! Who wouldn’t want golden sunshine on their wall? Love it! 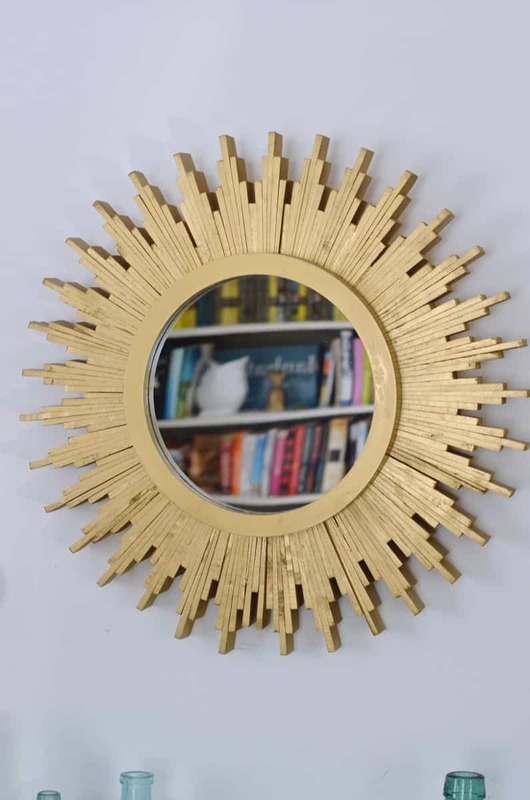 I made a shim mirror a couple years ago too – it’s a different style and dark stained wood, and I love how you did your pattern with the gold. So glad I saw this on the ditto diy gold challenge party! I LOVE THIS!!! I have been dreaming of doing the same thing for soooo long now. You executed my vision exactly. Thank you so much for sharing. I am so pleased that this worked out for you, not only because it looks great, but now I don’t need to do the trial and error to piece it together. It looks fabulous! This was a pretty simple project and most of the time was spent letting the glue dry… I’d say a few hours max on actual labor time but a couple of days because of the glue/ paint. Shims cost less than $2 for a pack of 10 or so. 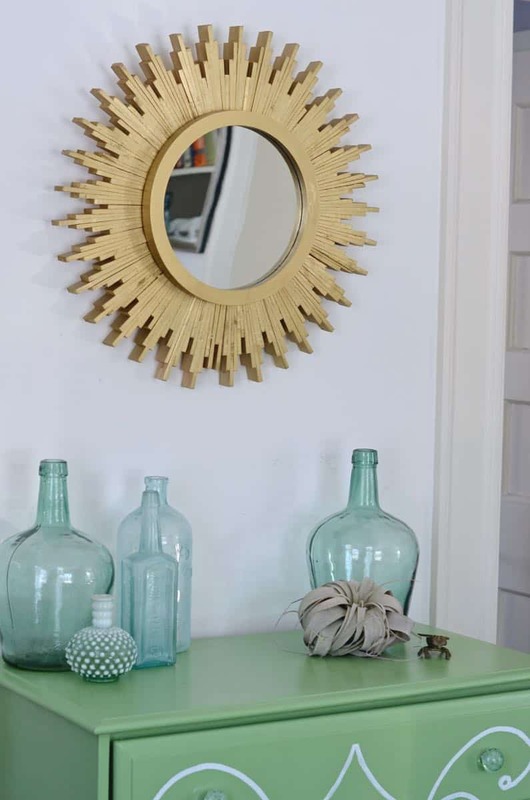 I already had the wood glue and spray paint… You can get round mirrors at a craft store for less than $10 depending on the size, but I liked this one from Homegoods for closer to $15. So… that’s maybe $50 all in and a few hours? Hope that helps! I love starburst mirrors and you did such a good job. This definitely says high end catalog NOT diy. They are amazing! I guess it takes so much time but worth it.